I have the honour to receive host of mails from devotees of different parts of the world enquiring how Sri Krishna Janmashtami celebrations were conducted by our Centre in South Africa. Thanks for their well-meant curiosity. I do take delight in expressing in detail an account on the Sri Krishnashtami celebrations here at our headquarters in Durban. There were Satsangs every evening from the first day to the last ashtami day i.e . for all eight days! Satsang here has a definite pattern. First four days I had vocal rest, as, a week back I had a bad laryngitis. On fifth day morning I addressed Senior Citizens at our Phoenix sub-centre. The point of my address was that the idols or pictures are not to be viewed as mere stones or paper but as a manifestation of the One, supreme Divinity. In the evening I reached Verulam where in the Gopallaala temple I met devotees and spoke on Sri Krishna’s mercy. On the sixth day I had to travel to Stanger, a one-hour distance in the severe cold. There also the Gracious God was the theme. 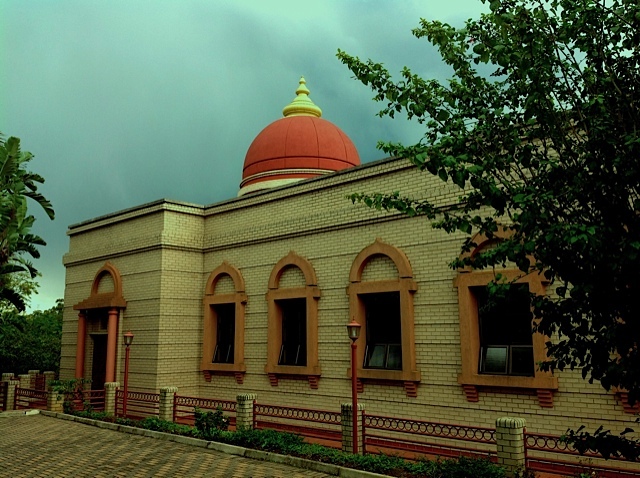 On the seventh day at our HQ Sri Ramakrishna Temple hall, I spoke on Sri Krishna and the Black Cobra. It was the story of poisonous Kaliya and how Sri Krishna tamed it and the spiritual import of this charming story. On the eighth day, which was the last auspicious ashtami evening, my theme for the discussion was the Divine birth of the Unborn. We had two sessions. In the first session the theory of Incarnation was dealt with. And in the second session the secret of the Unborn Supreme God appearing as baby Krishna to Devaki and Vasudeva was explained. Brother Saradaprabhananda this year went to Chatsworth branch and gave discourses there for all eight days on the significance of the Fourth chapter of the Bhagavad Gita. The first six evening Satsangs at HQ were addressed by our Youth members. I was witness to their speeches. On hearing them speak with confidence, I joined others in the audience in appreciating them for the research they had done on different themes and how they, in simple form, placed the ideas before the public. Every evening of the Krishnashtami celebration, Satsang attracted a large number of devotees. There were lot of bhajans and kirtans till the end of the program. Selected passages from Srimad Bhagavad Gita were sung to the traditional tunes every evening satsang. The temple was beautifully decorated. The yugal murti Sri Radha-Krishna bedecked with finery and ornaments dazzled every one. 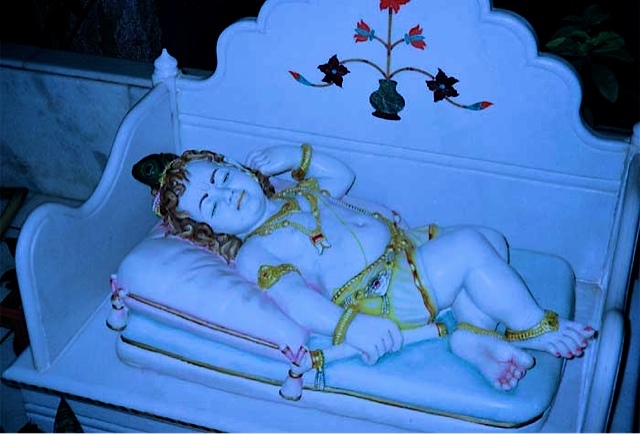 At the stroke of midnight 12, the baby Krishna in a beautiful cradle was brought out to the audience. Finally with arati to Sri Radha-Krishna and offering of flower and rocking the cradle by every assembled devotee the solemn program came to an end with distribution of prasad. The devotion of the devotees is worth noting; what a verve and vigour in singing bhajans! And faith and fervour in performing worship! And the day-long fasting and sitting in the temple for such long hours – absolutely maintaining utmost discipline – no chitchat, no gossip and all are tuned to the discourse and songs. The vibration of the event is pouring out from this article. Thanks from the core of my heart for forwarding details of Janmashtami celebrations with photos. I found myself in the audience. The ashtami was a wonderful celebration and we were indeed blessed to have such a structured programme that guided us with spirituality. May the love of Lord Krishna remain in our hearts. It is fascinating to know the Sri Krishna Janmashtami was celebrated for eight long days unlike the celebration here for one day. On the all the days satsangs were arranged and a lot of devotees participated in it. That too, no chit-chat, gossip and all participated in bhajans and kirtans! It is good to hear the news of spreading and practising our religion in distant place like South Africa. How is your health? You have mentioned about bad laryngitis. Hope you have recovered fully now. Revered Swami Jagadatmanandaji Maharaj is keeping fairly well except for his eye problem in the right eye. He had some allergy and he is improving. He conveys his love and best wishes and prayers for success for your spiritual ministration. Pranam. How are you now? We also celebrated Krishna Janmashtami. I came to know that you are coming to Belur. Please give me the information. Maharaj your darshan & ashirbad are very important for us specialy for my child. How is your health? Hope you are alright now. It is very interesting to read janmashtami celebration at Durban. When is your Pune trip? Vidhya and family wants to meet you. We also want to meet you in Kolkata. Please inform us the date you are free to meet us. We need your blessings. How is your health? 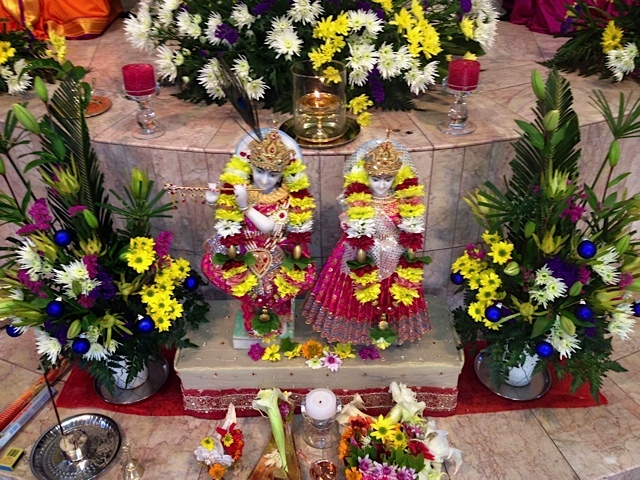 I read about your Janmasthami celebration at Durban. It is very intresting not only this every topic or subject you send us has a new flavour, I found them happening infront of my eyes. I also share them with my family and friends. We are all eager to meet you, Maharaj, when are you comming to Belur? Please inform us so that we could take your blessings. My mother is also very much eager to meet you. Please please please inform us. By Sri Sri Thakur’s grace I am doing well. How are you all? Recently I did visit Kolkata and was in Belur Math from 29th August to 5th Sept 2012. A few devotees from SA and also from Ranchi and Kolkata were with me during this tour. My program there was indeed hectic and I intentionally did not inform devotees because of lack of time. Hope to meet you and your mother next time! May Sri Thakur bless you all! I’ve read all your articles through Google and I like them so much. However after meeting you first time in our Delhi Mission day before yesterday, I’ve gained courage to write to you. The description of Janmashtami celebration at Durban is awesome. We came to know everything about the program. Pronam Maharaj, looking forward to meet you again in coming days. I can never forget the assistance that you gave for one of our SA devotees who needed to be hospitalised on his arrival in Delhi. Thank you very much from our hearts. Yes, it was indeed a pleasant meeting of devotees in Delhi many of whom I met for the first time. And within moments I could understand how deeply devoted you people are. Please keep up your contact with the Delhi Ashram so that your devotion at the lotus feet of the Holy Trio be on ever increase!